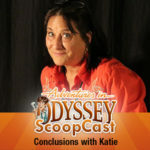 The Odyssey ScoopCast continues with its Album 57 review series! Kevin, Garrett, and Ryan move forward in their reviews of Adventures in Odyssey Album 57: A Call to Something More. The team reviews “No Chemistry Whatsoever” and discusses the relationship between Wooton and Penny, Connie and Eugene, and Whit’s wisdom.